Blue Ribbon Raceway - Horsham Motorsports Club Inc.
HORSHAM Modified Sedan driver Daniel Simpson wrote his own fairy-tale at Blue Ribbon Raceway on Saturday night, claiming the Victorian Title crown. With a few withdrawals and a late nomination, 26 cars contested the Victorian Modified Sedan Title. Simpson, a Horsham local, started out of Position Three for the final, behind Mildura racers Jake Drewett and Martin Hawson. While Simpson earned himself the title of Victorian Number One, earlier in the evening Drewett owned the action, recording three heat wins from three starts, despite having car dramas, and rocketing himself to a pole position start for the feature. Other heat winners for the night were Simpson, who took out Heat One, Darren Cockerill, Hawson (two heats), Jeff Leahy and Matt Nelson. “I was stoked to start off pole because after the parade I was going to load it up as we knew we had a head gasket issue,” Drewett said. “Dad (Mark) just said send it and keep an eye on it which is what I did. In the heats Drewett was able to open a big enough lead so that by the time his car began to shut down he was already in a position to win. In the final Drewett got the jump on the rest of the field and was dominant early on. “I knew Marty (Hawson) would be right there but knew he wasn’t under me as I can hear his car when he is i was just hoping to lead as many laps as I could,” Drewett said. Hawson got around Drewett eight laps in and coming into lap traffic the Number 18 started to run hot and lose power. “I lost my ability with the car to keep it rotated getting mid corner pushes,” he said. With Drewett pulling infield it left Simpson to chase Hawson, but with only four laps to go Hawson also came to a halt infield. “I’m really shattered for Marty because as most people know I’m probably one of his biggest fans,” Drewett said. Heading into the event Simpson said he was looking forward to racing in front of his family, friends and sponsors but after winning the event he described the achievement as “unbelievable”. “I wouldn’t have wanted to have done it anywhere else,” Simpson said. He took the first heat despite having mechanical issues. “In the first heat the new gearbox I put in for the night was jumping out of gear so I had to hold it in with one hand for the whole race,” Simpson said. “So I thought that might have been the start of a tough night. Starting from Position Three Simpson lined up behind two of the Modified Sedan drivers he considers fastest in the country – Drewett and Hawson. “Both are racers I respect a lot and I knew they would have been on it from the start,” Simpson said. After Drewett’s demise and then Hawson’s exit, Simpson found himself briefly in a state of disbelief. “It was a bit of a shock for a second or two, then my main focus was to push harder not knowing how close everyone else was,” he said. Simpson crossed the line and took the chequered flag to the cheers of the local crowd, a reception that was mirrored at the presentation after his win. “It is definitely a career highlight and a special moment in general,” he said. Simpson said the win was even more special with good friend Brody Chrystie claiming second place, while fellow Victorian driver Darren Cockerill, Andrew Blackwell and Kye Walters rounded out the Top Five. Jeff Leahy, Mick Johnson, Chris Hayden and Peter McCarthy were the only other drivers to go the full distance. Angelo Halacas completed 32 laps, Jakobe Jetson and Matt Nelson 20, Graham West 15, Aidan Raymont, Rachel Pratt and Russell Bent 13, Matt Gerlach and Russell Felsovary 12 and Dale Hallett two laps. Saturday night’s Title brings Simpson’s racing season to a close, but he will be back next year with the Victoria One on his panels for the VMPA Series and to contest the Australian Title. Speedway action at Blue Ribbon Raceway on Saturday night showed the fickle nature of motor racing resulting in a very popular win by local Horsham Motorsports racer Daniel Simpson to become Victoria #1 in Modified Sedan competition. In the lead up to the championship Simpson’s chances of a title looked very challenging when an encounter with the wall at Premier Speedway in Warrnambool left a very damaged race car parked high in turns one and two. Two weeks of hard work saw the HO 33 of Simpson on track for first heat. The cars of Matt Gerlach and the sentimental crowd favourite Graham West in his very fast LJ Torana also suffered significant damage at Warrnambool but were also ready to do their utmost to keep the title in Victoria after a trip to Queensland with Aiden Raymont also intent on keeping it. Heat one saw Simpson show the depth of his desire with a flag to flag win by 10 second over Jetson followed closely by Chrystie and Gerlach. Heat two saw the cars of Raymont and coming from the back end of the grid to challenge Atkins mid race with Drewett taking the win over Atkins and Raymont with only .03 secs seperating them ad West in fourth. Heat three saw another hard charge from the rear of the field with Martin Hawson took the lead on lap four and held on with Kye Walters in second and Chris Hayden holding off Blackwell by .3 seconds, Hawsons fast lap of 20.334 seconds set the tone for the night. Heat four saw another hard charge from the rear of the field with Simpson off the back row getting to fourth by lap three and with starting and finishing one/two Simpson got the better of Blackwell on the last lap for third after a six lap battle by half a second. Heat five was a run away win for Darren Cockerill from pole with an eight second gap on a charging Russell Bent .03 seconds ahead of Jetson in third the cooling temperatures saw Cockerill lower the lap time below 20 secs to 19.699. Heat six line up had the cars of favoured runners Raymont, Walters and Hawson pitted against each other in what was a hard fought battle for the minor placings with Hawson running away with another low time of 19.294 and Walters and Raymont battling for six laps Walters taking second with one to go. Heat seven again saw Jake Drewett in the MDA 18 charge from the rear of the field to take a narrow win over Hawson who fought through the field from last half way through the heat to miss first by half a second with Rachel Pratt five seconds back in third. Heat eight saw Daniel Simpson start near the rear of the field but by lap three was chasing down Matt Nelson and eventually taking the lead on lap eight only to lose it one lap later to finish second to Nelson with Walters in third and only .6 seconds seperating the top three. In one of the closest heats of the night eleven seconds sperated the field of nine over the ten lap race. Places changed constantly during the heat with the car of Leahy taking the lead on lap two and the minor placings being decided by lap six with the final placings Leahy, Cockerill and Burr setting the scene for a barn burner of a final. Twenty one cars lined up for the final and after the formalities of driver presentations set off for 35 laps to determine the Victoria #1. MDA 18 Jake Drewett got a holeshot on the field at the flag and looked strong but was challenged on lap 8 by the MDA 72 of Martin Hawson who took the lead. By lap twelve the cars of Matt Gerlach and Russell Felsavory were infield followed one lap later Rachel Pratt, Russel Bent and the reining Vic #1 Aiden Raymont followed shortly after by Graham West all from contact. This left a wide open track for the field to battle for the title. Leader Martin Hawson was also involved while leading but continued on. Lap 30 saw the car of Hawson leading Simpson, Chrystie, Cockerill and Blackwell and all lapping within view of the chequered flag. Dramatically coming out of turn four while being chased by Simpson, Hawson pulled onto the infield to the shock of the crowd and Simpson took the lead on lap 32 and would not be challenged from that point to take first place and the title of Victorian Champion by four seconds from Chrystie and Cockerill followed by Blackwell and Walters for the podium. Seven seconds separated the top six finishers and Simpson’s best lap was a 18.556 at 100.884 km/h. Simpson now has the right to carry the Vic #1 on his car for the next year and after not knowing two weeks before if he would even make the field his win was a huge effort and brings the title back to Victoria. Caption Victoria #1: Horsham’s Daniel Simpson celebrates his win in the Victorian State Title at Blue Ribbon Raceway. Photo Courtesy of Jamie Collins. 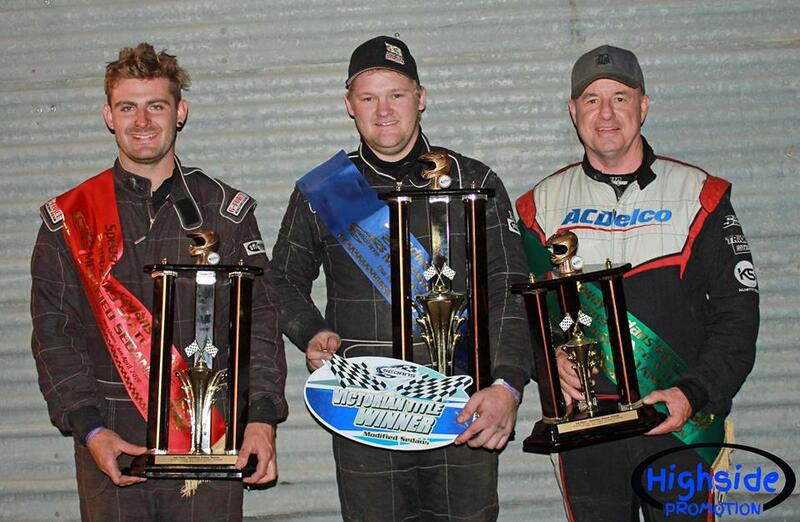 THE Victorian Modified Sedan Title will be held this weekend at Horsham’s Blue Ribbon Raceway. Thirty cars have nominated for the event including defending champion Aidan Raymont and the best of the best of the Victorian Modified Production Association. Raymont took out the T-Bar Nationals event held at Toowoomba on the weekend and is coming into the Title in good form. Horsham Motorsports Club is proud to announce the running of the Modified Sedan Victorian Title at Blue Ribbon Raceway proudly sponsored by Horsham Auto Wreckers on April 6. After the hugely successful Australian Title held at the raceway last season the club was pleased to be offered the chance to hold the title at the last minute after issues with another Victorian facility and in a very short time had secured sponsorship to hold the event. With nominations in excess of 30 competitors coming from across Australia to compete for this prestigious title including current Victoria 1 Aiden Raymont coming down from Queensland to try to hold onto his crown. After a long and busy season the ‘mods’ have put in a ton of laps at tracks across the country and it has taken a toll on some of the cars but all the teams are working overtime to be ready. With Raymont wanting to hold onto his title and any number of challengers aiming to bring the title back to its home, with issues at the last round of the VMPA series the cars of Daniel Simpson, Matt Gerlach and the super fast little LJ Torana of Graham West have had a lot of shed time to iron out the wrinkles from various bumps and bangs but have all got their eyes on the target. Not to be outdone the cars of Micheal Hayden, Aaron Bunton and Kye Walters, are not to be ignored. With the absence of the winner of the final round and the Di Watson Memorial at Premier Speedway, David Smith, due to family commitments the field will again be wide open. The controversy of the final being shortened by nine laps still leaving questions among the drivers that will be settled at the drop of the checkered flag at Blue Ribbon Raceway. Following on from the success of the Australian Title last season Horsham Motorsports Club has put a lot of effort into finding sponsors for the event and the business community has come to the party with the event being predominantly fully sponsored and with the support of the speedway community it will be a huge night of racing. Also on the program will be the Victorian Mini Sprints and Production Sedans. The mini sprints are virtually smaller versions of the popular Sprintcars but powered by motorbike engines and with their size and low weights they can get around the race track as quick as any of the other classes. The Production Sedan competitors have had a long season showcasing the best drivers in the class with seasoned drivers and rookies running bumper to bumper with basically stock and equal cars depending on skill and nerve and will, as usual, put on a spirited display for the local fans on what will be a big night of racing for all classes. Extreme temperatures ahead of Saturday nights action did not phase the enthusiasm of Blue Ribbons regular fans and competitors alike with the running of the Robin Thomas Memorial for V8 trucks, the Les McMaster memorial for Limited Sportsman and the return after more than two decades of the SDAV Hotrods. The extreme weather pushed the track crew to the limit and the clubs decision to push the start time back for the safety of the competitors and fans alike and gave the crew more time to prepare the surface. The positive attitude of the drivers was bought out in a comment, “its dirt not blacktop lets give them a show”, and that’s what they did. With the prestigious Les McMaster Memorial on the line Sportie drivers were focused on the goal from the drop of the flag and with the challenging conditions of the night it was going to be survival of the fittest. Two fields of sporties were split into three heats each and with previous winners Mark McDonald and Jock Baker aiming at taking the trophy home it was not going to be easy with Adam Mckenzie, Craig Ansell and Travis Matthews showing good speed. In the heats Baker showed a clean pair of heels to the field taking the win in all three of his heats without giving up the lead at any time and showing how to set up his car on a track that was hard for the low slung cars to get around. McDonald was not to be denied taking a second and a first before secoming to a flat tyre in the third heat and a DNF. McKenzie and Aston took the remaining heat wins to put the question mark on the final. After a track resurfacing the drop of the flag saw the SA 1 of Baker get the holeshot on the field with the cars of McKenzie and Aston in pursuit. With Baker moving further ahead the racing in the midfield became intense with positions changing continually until lap 7 when the 74 of Stevens dropped from the race followed by the 13 of Carpenter on lap 10 and the 27 of Matthews in the final laps. Jock Baker took a convincing win over a fast finishing Adam McKenzie and Mark McDonald finishing a close third from a start in the mid field. Powering; Jock Baker on his way to his 6th Les McMaster Memorial. Robin Thomas’s legacy with Blue Ribbon Raceway is long and varied and the V8 trucks was one of them, truck drivers in the club look to this as the high point of their season and with new trucks coming into the class the competition was intense. With the drop of the flag in the first heat it wasn’t long before Luke ‘Redda’ James took his usual position up high on the wall at the head of the field and Wes Bell and Nathan Bird in pursuit until the truck of Bird suffered engine issues and was out for the night. The second heat saw James again running high and taking the win in a green white chequer finish over a fast finishing Fletcher Mills and Brendan Jackson making for an interesting third heat and final. Heat three was one of the best fought races in recent meetings with Fletcher Mills in the 44 and James in the 57 trading paint and positions all race long with James taking the win with a low pass over Mills followed by Bell in the 22. The final of the Thomas Memorial looked to be a barn burner and James took the lead over Mills, Bell. Entering turn two the truck of James took a right turn and hit hard into the wall and suffered a broken steering box and was out for the night, a very rare occasion for Redda. On the restart Mills and Bell battled as did Jackson and Carman changing positions throughout the race. Mills took the win over veteran Bell with Carman in third ahead of Jackson. Lesson learned; Student Fletcher Mills battled the teacher, veteran Wes Bell to win his first Robin Thomas Memorial trophy. Photo courtesy M&L Speedway Photography. With over two decades passing since the last visit of the SDAV to Blue Ribbon Raceway competitors and club members were excited at seeing these cars on the wide open spaces of the speedway. After their Victorian title in Bairnsdale the week prior the members had a lot of work before getting to Horsham and new Victorian 1 Stan Marco Snr wanted to stay out in front of the pack. Heat races saw the 84 of Shannon Meakins take a flag to flag win in a car that was not rebuilt until 9am Saturday morning before making the trip after a big roll over in the title followed by Stan Marco Snr and Jnr taking the minors. Heat two saw Stan Snr take the lead on lap 3 from Phil Jenkins and held the lead to win over Stan Jnr and Shannon Meakins. Stan Marco Jnr, showing the apple doesn’t fall far from the tree with a flag to flag win over the hard charging Meakins and Stan Snr chasing the duo home for a strong third. The final for the hot rods again looked to be very tight with Meakins and Stan Marco Snr battling wheel to wheel for the entire race with some extremely close passes right to the flag with Marco Snr taking the narrowest win over Meakins followed by Stan Marco Jnr, Kali Hovey, Phil Jenkins and Russ Hovey in a great return to Blue Ribbon. Epic Battle; SDAV Hot Rodders Stan Marco Snr and Shannon Meakins waged a great battle in the final before Marco took the win. Production sedans had a run at the track in the paddock sponsored by Alice Mobile Car Detailing, with local driver Ryan Queale wanting to prove his mettle in front of the home fans. With Australia 2 Dehne Sparrow in the field it was going to be a hard ask for the competitors and it came to pass with Sparrow taking two heat wins and a second and winning the final. Adam Wilson took the win in the third heat but did not finish the final with Shane Hammond in second Zak Calderwood in third and Queale a creditable fourth place in a great effort. Pressure; Horshams Ryan Queale puts it where he needs to bring home a creditable fourth on home clay. Horsham Motorsports next meeting will be held on April 6th proudly featuring the Victorian State Title for Modified Production Sedans and support classes.